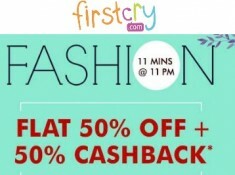 FirstCry Offering first 500 Orders Free On His Free At Three Sale, Sale Will Stream on 13 Dec At 3 PM. There You Can Buy More Then 2 million Baby Care And clothes Products In Free Of Cost with The Worth Value Of Rs.2500. Stay Tuned! Register Now. Reedem Coupon Tomorrow When Sale Begin.